Our client for this project was Christopher Wren Developments who were building three two-bedroom bungalows and wanted designs that would appeal to a broad spectrum of buyers. Their brief was for us to create three individual kitchens, each one different but all with modern, clean designs based on the same layout. 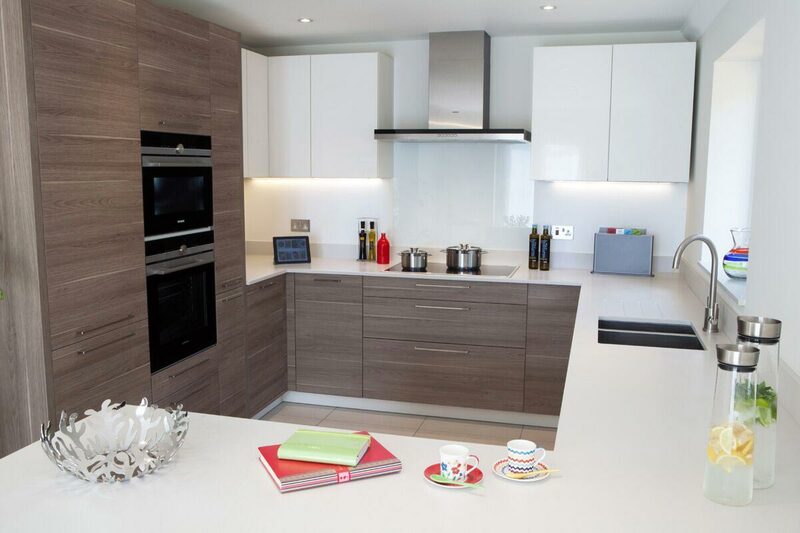 Although we needed to work to a fairly conservative budget, we also needed to incorporate premium appliances to the good quality cabinetry as their potential buyers would expect a high specification kitchen to mirror that of the build. The designs also included pull out storage systems and integrated waste systems with recycling compartments. The bin system and A+ rated appliances were chosen intentionally to satisfy an energy efficient development that included renewable energy sources for the heating system. 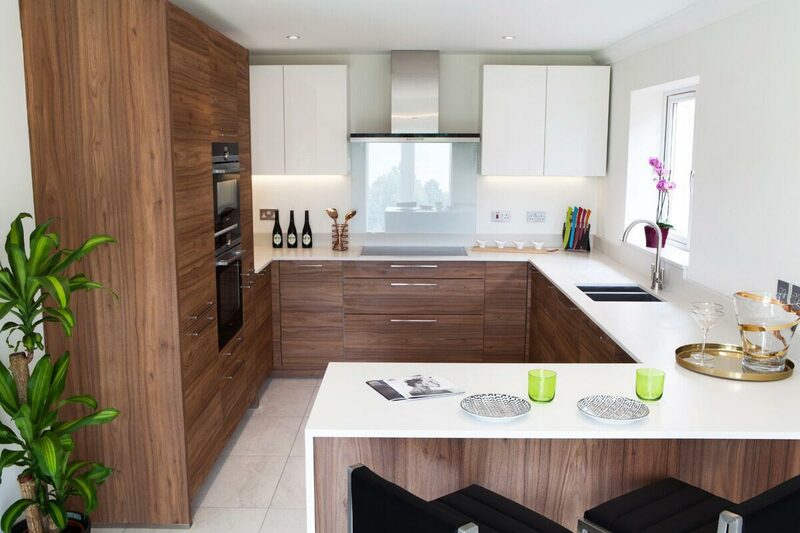 For Plot 1 we selected a fresh grey stained effect wood mixed with white gloss wall units and off white SlabTech acrylic worksurfaces. 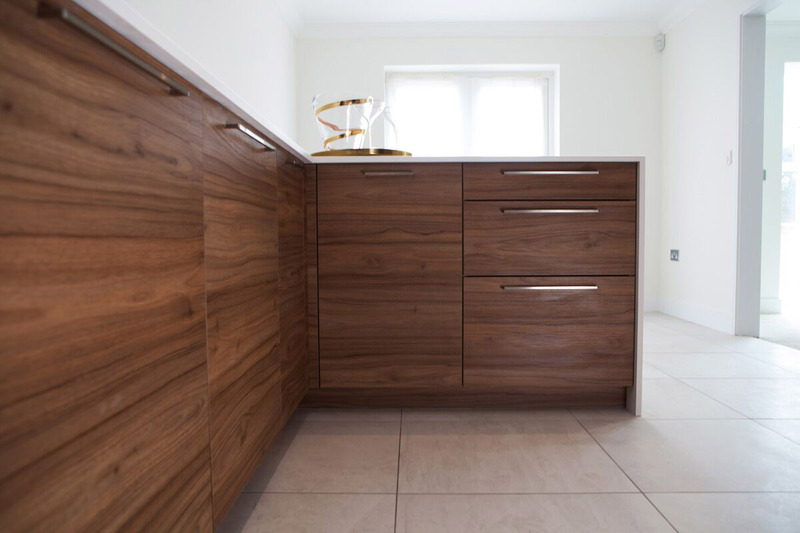 For Plot 2 a similar but warmer feel with walnut effect doors mixed with white gloss wall units and off white SlabTech acrylic worksurfaces. 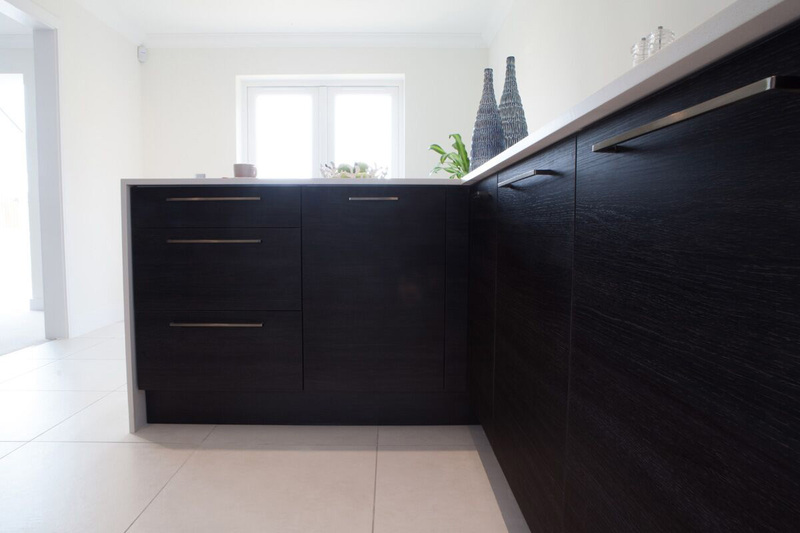 And for Plot 3 a more dramatic dark/ebony wood effect that contrasts beautifully with the off white SlabTech acrylic worksurfaces and white gloss wall units. The design on each of the kitchens incorporated a range of integrated appliances, oven and combination oven in a tower, large induction hob, glass splash backs and a breakfast bar on the peninsular. The worktops had a slab end where the tops are returned down to the floor creating a feature that also supports the breakfast bar overhang. We continue to work with developers and contractors as well as our direct clients and are always pleased with the end results and the feedback we receive. Phil Robinson, Project Director at Christopher Wren Developments.